Teaching students to be prepared for the modern world is a hard task. 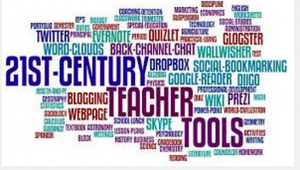 Teaching using technology can be default because it is ever changing. Adapting to those changes can be a challenge. But as you can see from the picture above many great tools have been created for us to use in our lessons. I try to adopt at least one new tool a year to help with education. You also have to have a good clear vision when adopting new tech tools. You never want to have your students feel that they are on tech overload. I like to see a blend of online learning with a mixture of book and classroom instruction. This way we can reach all types of learners. Some students will learn better at a self-pace while others strive to keep pace in the classroom. Using a good mixture of both will keep all of the students engaged on the subject matter. I do believe in digital notes. How many times have you wanted to refer to a note to find you left it in the office or classroom? With digital notes and using a tool such as Evernote or Google Keep, I can always have my notes on every device I carry. Besides, it is easier to carry my phone in my pocket then carry around my paper notebook. I finally did it I pulled the trigger and bought a new phone. Not just any phone I went way off course and bought a Windows phone. I always said I would never run Windows on my phones but after watching Windows Weekly and following Paul Thurrott I thought I would take the plunge. I am not convinced or not that this phone is bad or good. I do not like the shape of the phone but I think a case may fix this issue. Also there are some differences in the apps as to other phones. I will do some follow up posts on this phone over time. I have 12 days to like it or return it. So far it is a joy to use and I would recommend it.